Cedars-Sinai Medical Center, world renowned for its patient care and service to the community, has launched a re-imagination of its campus: With a newly rising Advanced Health Sciences Pavilion as the cornerstone of a 21st century masterplan, the largest not-for-profit academic medical center on the West Coast has sought to make its public and green spaces even more inviting to the people who visit this urban oasis, a neighbor to the cities of Los Angeles, West Hollywood and Beverly Hills. 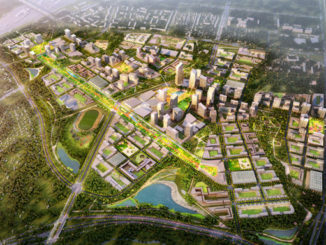 A key phase in this welcoming effort can be seen in Levine Park, opened in 2011 and serving as a gateway. 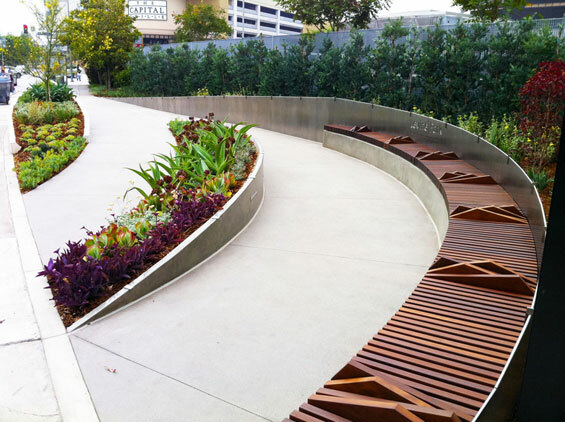 The park’s dynamic forms beckon pedestrians into the campus, featuring a seat wall, planters and a green hedge which encircles a parking lot for patients. Levine Park, a popular spot for patients, their families and neighbors, provides a verdant respite and a moment’s peace and contemplation in the midst of a bustling neighborhood. 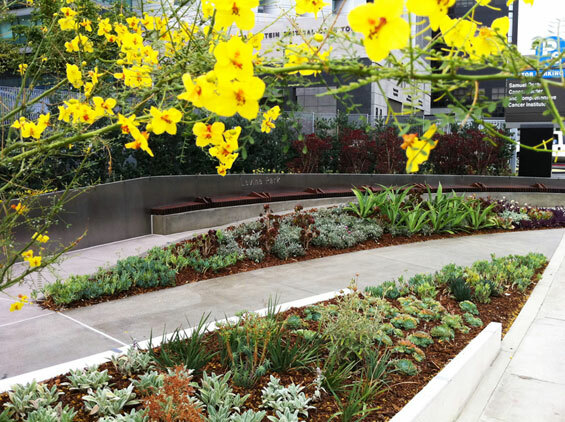 The park is a discrete showcase of the campus-wide effort to balance and juxtapose soft, native plant species and people-friendly passages with the contemporary lines of the hardscape and the state-of-the-art facilities. Ipe wood slats used on the seat wall in varying angles create subtle visual separations, providing a compelling shadow pattern. 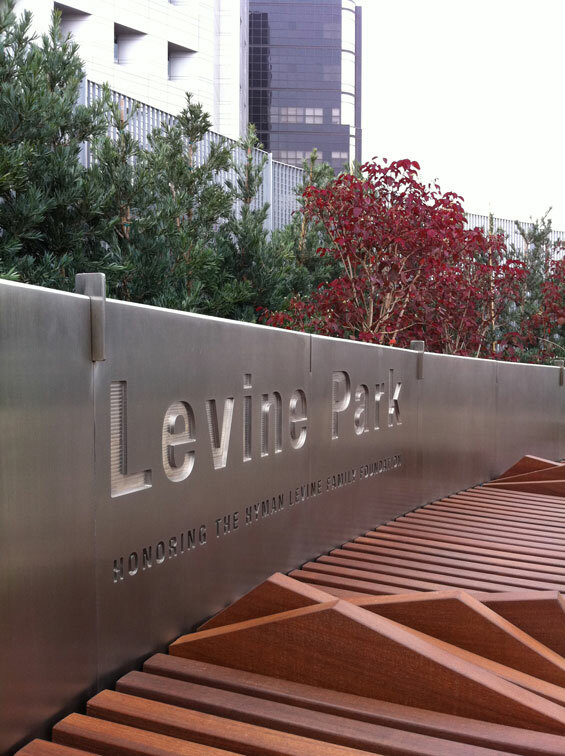 Stainless steel panels serve as a connecting vocabulary between Levine Park and the second phase. The welded panels create a dynamic. Three main planters are the focal points of the park. The front planter reinforces the sense of movement through the dynamic emerging walls cladded with Jerusalem stone. 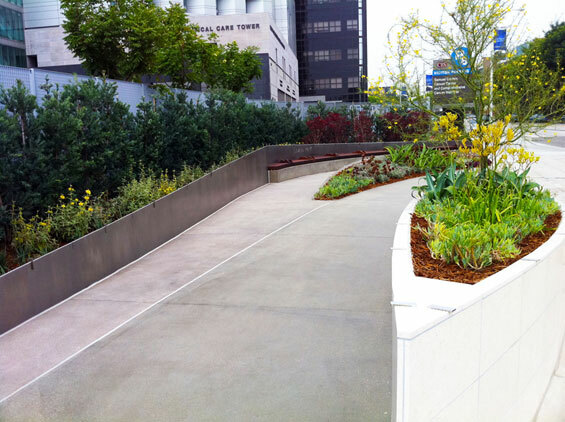 The canted top of the walls allow plant material to grow closer to passers-by. 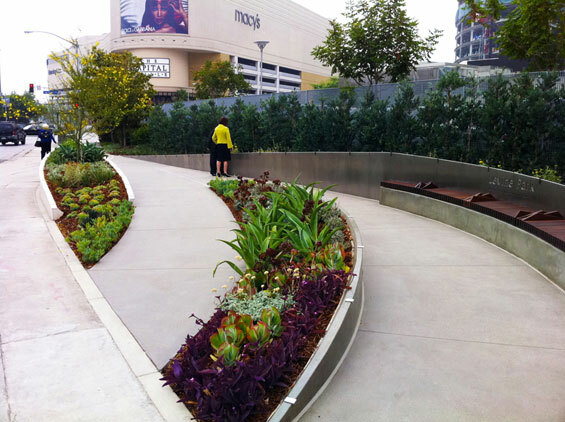 The curved middle planter wall consists of polished concrete, notched with lights. The back planter features a Podocarpus hedge which acts as a green curtain, creating a landscape backdrop for the park. Signage recognizing the Levine Family Foundation was incised into the stainless steel wall and is highlighted by night lighting. The native plant palette provides a contrasting yet soothing sculptural element.